This Saturday, 12 May 2018, UNISON Bexley branch will be marching in support of public services in central London. There’s more detail about the march in our previous post, Step up for public services, but the key detail is to meet us at Charing Cross station at 11am – with our brand new branch banner! The 1.5m banner was designed last month by our branch Communications Officer and incorporates tributes to two historic residents of the Bexley borough area – but can you guess who those people are? 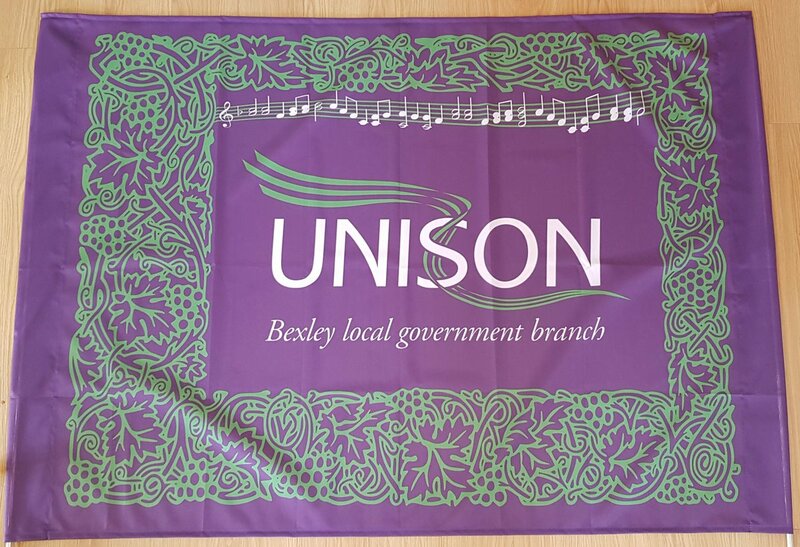 An ability to read music and/or think laterally about UNISON, our colours and our use of the banner may help with one of the two! Come along and march with us on Saturday at 11am at Charing Cross and we’ll reveal all!